Alex Braidwood captures the audio wonder of life. Alex Braidwood’s quest to record unusual soundscapes has taken him to far-flung corners of the world, including Australia Alpine National Park for an artist-in-residence project in early 2015. Photo courtesy of Alex Braidwood. To do that, he says, students have to consider the specific qualities of each sound—its timbre, its color, the way it starts and fades away. Is it biophonic, like birdsong? Or geophonic, like rain? Or maybe it’s anthrophonic, human-made, like that big old bus. Braidwood mixes sounds at a computer in his home office, where he experiments with blending sounds from different sources. Photographer: Duane Tinkey. But Braidwood’s own ears get lots of practice. 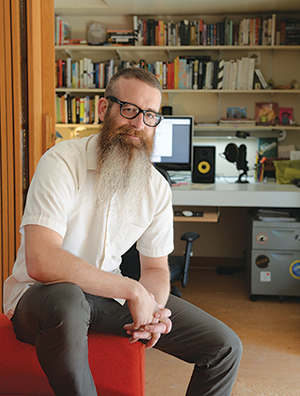 The multimedia artist teaches in several programs at Iowa State—graphic design, sustainable design, human-computer interaction—and he studies soundscapes, which comprise all the sonic details that make one place sound different from another. He can talk about sound the way a painter talks about light or a sommelier talks about terroir. When I met him this summer at his house, in the woods northwest of Ames, he led me out to the back deck. Hidden birds chattered in the trees. Cicadas buzzed to beat the band. Braidwood’s ears have heard things all over the world, from a Chinese train station to an Indian tomb to an Australian national park, but one of his favorite soundscapes is in his own backyard. He loves the dawn chorus, right before and after sunrise, when all the critters are especially lively. He moved here last year from downtown Des Moines, where his ears perked up for different reasons. “You hear this massive roar and rumble” when trains pass over the bridge on the Des Moines Riverwalk, he says. Farther south, along Martin Luther King Jr. Parkway, the trains bounce noise off the canyon of brick warehouses, especially in the winter, when snow muffles everything else. Last year he installed solar-powered recording devices at five locations in Des Moines: an alley behind Kitchen Collage, the Des Moines Social Club courtyard, the DART bus station, Crane Artist Lofts and a house near Keosauqua Way. After a few weeks, he dropped the recordings into a computer program that randomly twisted the audio strands into music he then pumped from a ring of speakers at the Des Moines Art Center. The mashup of cars, sirens, jets, helicopters, skateboards and heavy construction machinery was surprisingly soothing. People don’t always expect art and science to overlap, but really, they’re just different ways to figure out the world. Braidwood dabbled in both as a kid in northern Michigan, and he was always fascinated with recording gadgets and computers. As a high school sophomore, he “slid in” to an art class at the local community college—his teacher mistook him for a senior—which inspired him to study graphic and interactive design at an art school in Detroit. “By that point, I was completely sucked in,” he says. He enjoyed the challenge of combining his skills as an artist, musician, photographer, videographer and computer programmer. He and his classmates learned about a new-fangled wireless technology called Bluetooth, back in 2001, and tinkered with other marvels of the new millennium. “We were going to Best Buy to play with PalmPilots to see what they were all about,” he says. That curiosity still drives him now, at 38, when a grayish beard that could hide all sorts of microphones hangs halfway down his chest. For the past few summers, Braidwood has directed an artist-in-residence program at Iowa Lakeside Laboratory, which the three state universities operate in Okoboji. He teaches acoustic ecology there and keeps an eye on a tricked-out buoy he dropped two years ago into West Okoboji Lake. Its sensors record various data about the water—temperature, oxygen levels, pH balance—which Braidwood translates into fluctuating layers of music, similar to his project in Des Moines. If the water’s surface temperature is 68 degrees, for example, his computer program might start at the 68th key on a piano and then move up or down the scale as the water warms or cools. She recalled one scientist who listened to the music and heard a slight variation—a wrinkle in the pattern—that signaled a change the researchers might not have noticed by studying the charts. As it turned out, one of the sensors had malfunctioned. and a handful of other downtown sites. He wove the clips into a sonic tapestry for a project called “Listen Right Here: DSM” at the Des Moines Art Center. 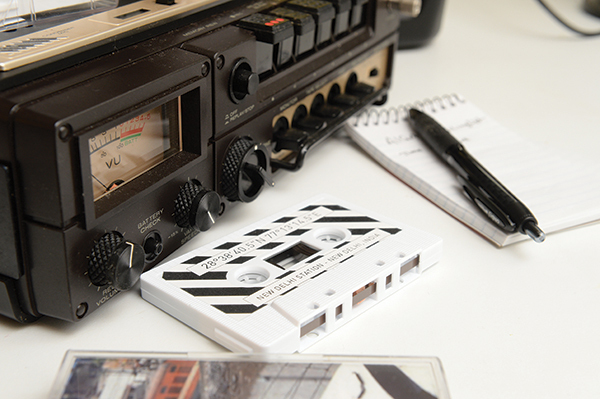 Like a photographer who still uses film, Braidwood often records his work on cassette tapes rather than digital files because he likes the notion of sound as a tangible artifact or piece of art. But we’re missing more than whatever lurks underwater. Braidwood’s mission is to get people to pay attention to the sounds in their everyday lives. He launched an initiative called Listening Instruments (listeninginstruments.com) that includes an array of workshops and projects to encourage people to use their ears more intentionally. Whenever Braidwood leads listening tours around town, he asks the groups to be quiet and listen for 30 uninterrupted seconds. That isn’t a long time, but it feels like an eternity if you usually rush from one thing to the next. I tried it in Braidwood’s driveway in Ames, on my way back to the car. A twig snapped. A breeze rustled the trees. Cars whistled by on the county-line road. My pen whispered across the lines of my notebook. It occurred to me that if the local food movement ever fizzles out, maybe we should try local sound. There’s a lot to take in. Opera singer has stratospheric vocal range.